H. Torczyner, Ren Magritte: signes et images, Paris, 1977, p. 120, no. 208 (illustrated). P. Gimferrer, Magritte, Paris, 1986 (illustrated in color, pl. 122). H. Torczyner, L'Ami Magritte: correspondance et souvenirs, Antwerp, 1992, no. 16 (illustrated in color, pp. 34 and 260). R. Magritte, Magritte/Torczyner: Letters Between Friends, New York, 1994, p. 90 (illustrated, p. 91). 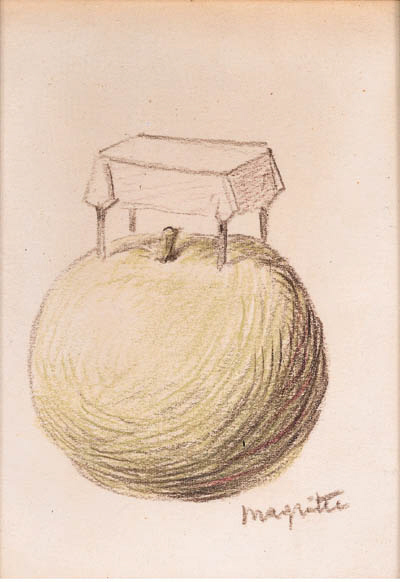 In a letter to Torczyner dated 3 October 1963, Magritte wrote of this drawing, "Beautiful Realities is in keeping with this idea that the well-known 'sense of reality' does not have to be understood according to the stubborn prejudice that 'reality' is always ugly, exhausting, etc." (R. Magritte, op. cit., p. 90). Here Magritte creates an image of beauty and order. A familiar situation is inverted, with the table balanced carefully atop the apple, one of the artist's most recognizable elements. The objects appear as if floating against the background, and perhaps allude to a redemption from evil and ugliness. Magritte also produced oil and gouache versions of this image, similarly titled, in 1962 (Sylvester, nos. 1508 and 1523; private collections).